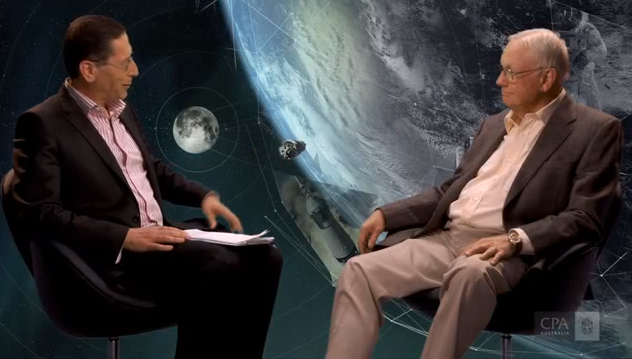 L'ultima intervista di Neil Armstrong? 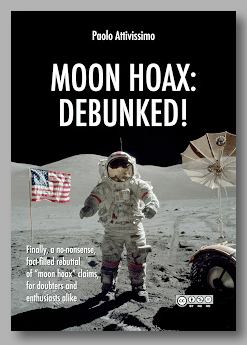 Alla fine di aprile 2012 Neil Armstrong ha rilasciato una lunga intervista ad Alex Malley di CPA Australia, un sito dedicato ai revisori di conti, in cui ha raccontato numerosi dettagli della propria carriera e del proprio modo di vedere il mondo, con buona pace di chi insinua che Armstrong non concedeva interviste perché si vergognava di aver partecipato alla messinscena lunare. A quanto mi risulta, si tratta dell'ultima intervista pubblicata prima della morte di Armstrong il 25 agosto scorso. Qui sotto ne trovate la trascrizione, realizzata con la collaborazione di Elena Albertini. Se vi interessa sponsorizzarne una traduzione italiana, fatemelo sapere nei commenti. Malley: Neil Armstrong, a very warm welcome to Australia. Armstrong: Thank you so much. Malley: The words determination and destiny keep coming to me and the way in which your life's unfolded I'm not quite sure of the order of those at times, but certainly your first air show at two years old your dad took you to, your first airplane flight with your dad at seven, and your pilot's license at 15 tells me a lot about determination. Armstrong: Yeah, I had become fascinated with the world of flight as an elementary school student and determined that somehow I wanted to be involved in that and as I learned more about aviation I thought: “Design – that would be the epitome of an aeronautical career, to be a designer”. And so that's what I strove for. Malley: And in terms of your mom and dad, Stephen and Viola, your dad was a public servant in Ohio and traveled a lot in his role. What did your parents collectively teach you and give you as a foundation? Armstrong: Well, they – my father was an auditor and he audited the books of county governments across the state where we lived, the state of Ohio, and so we were transient, my father moved the family along with him as he moved around the state while we were young. And I think they were very accommodating. They allowed me to do... pursue my own interests, and I'm forever grateful that they gave me that freedom. They didn't try to dictate to me what I should do or where I should go. 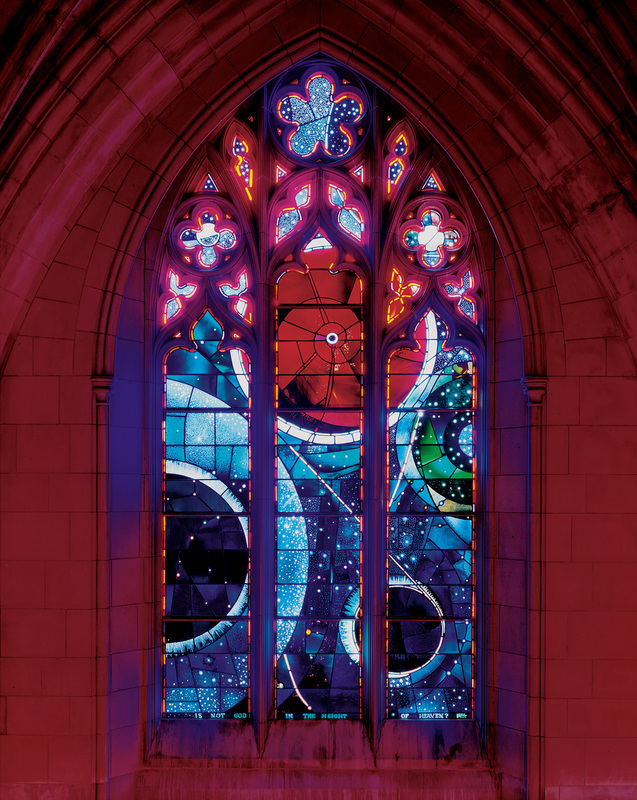 Armstrong: Well, I think many younger people are uncomfortable with the thought of death, whether it be themselves, their relatives or their pets, and I've shared that uneasiness about facing the reality of death and it took me some years to sort of circumvent that concern. Malley: So then of course, Neil, you flew 78 missions in the Korean War and again took some chances. What are your reflections on the risks you had to bear, you and your colleagues? 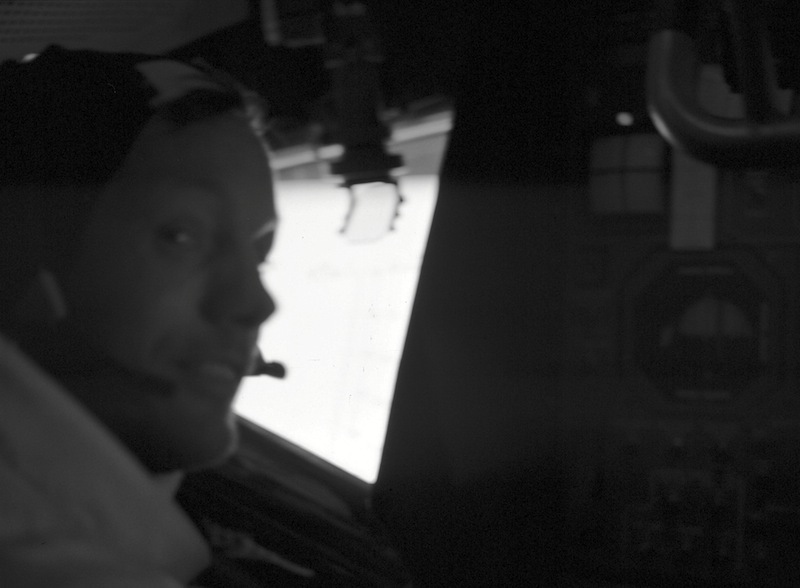 Armstrong: The risks in combat are substantial, and I think in general they are higher risks than I faced in my test pilot work or in my astronaut work. And the consequences are severe. And there is a good side and a bad side. The bad side is that you lose colleagues, and that's painful. The good side is you have – you create very strong bonds with your colleagues that survive, and those bonds exist throughout your lifetime. And I value those experiences very highly because they built a lot of character, they built a lot of backbone and you were a better person for having learned to endure those – that environment, that situation, and those risks. Malley: So, Neil, your test pilot career was, you know, as everything else in your career a distinguished one. But tell me what a test pilot feels and what it does feel like to get in those jets as you did so often: the exhilaration, the moment, the responsibility? Armstrong: The test pilot is solving problems. He is looking for inadequacies or shortcomings or barriers to substantial safety and increasing performance in flight, and his job is to identify those problems and assist in finding a solution. So it's a problem-solving job, and you're always working with the unknowns. And I found that a fascinating part of my career path. I really enjoyed the opportunity to contribute in some way to the solution of problems. The history of humanity has been, you know, slowly increasing the boundaries of knowledge and knowing more and more and more and feel comfortable inside there, but at the edges it's always going to be a challenge. Malley: Yeah, absolutely. And to those edges, your first flight, one of your first flights in the B-29... Now being an accountant, I can do the numbers, and if one engine out of four is working I'd be worried – and that's without any pilot experience. What happened that day, and how did you work through the problems? Armstrong: I was a pilot, one of the two pilots of the B-29 carrying a rocket aircraft to altitude where we would release the airplane and it would go doing the testing and we were just providing the service – get the rocket airplane up to a starting point. And we were somewhere up above 30,000 feet when the governor on one of the propellers failed and the propeller started running away – that is, going faster and faster and faster. And of course at some point in time it's going to explode. And so we had the choice of either slowing down to try to slow down the propeller or speeding up so that we could drop the rocket. We chose the latter, dropped the rocket and almost instantaneously thereafter the propeller exploded and blades cut through the – it was the right... far right engine – cut through the number three engine, cut through the fuselage and the number two engine, and left only the number one engine running. That's an uncomfortable position, one out of four. But fortunately we had a lot of altitude and we had a big dry lake bed not too far away where we could land so we could make a very gentle – very gentle turns and keep the power back and sort of make a gliding approach into the landing area. The second pilot, his control cables had been cut by the propeller, so his controls were of no use whatever. I still had control. so I was flying the airplane and he was doing the thinking (laughs). And when we got to the ground and looked at the airplane afterwards, we found my cables had been cut too, but there were still a few strands of the cable left. So we were very fortunate to have survived that situation. Malley: Extraordinary. And look, another example, I guess, was in the lunar training, when you had to eject from the rocket within seconds of your life, as I understand it. Take us through that. Armstrong: Well, we needed something to simulate landing on the moon. The moon has no atmosphere, so you're flying in a vacuum, and the gravity is much lower, so the characteristics of the flying machine in that environment are very different than they are here on Earth. And we felt we had to understand those variations and be able to feel comfortable in flying the lunar module to the surface of the moon in the actual conditions. So this device did provide very good training and experience in that mode. Unfortunately it was a complicated machine with a lot of different rockets and wires and claptrap of all this – and consequently it was subject to malfunction. And one of these malfunctions snapped on me one day and I lost my control system, and you know pretty quickly that's it's time to go and part company with your friend. And I did that and the ejection seat worked very well, fortunately, and I bit my tongue and that was the only real damage. Malley: And as I understand it, as the legend goes, you know – that's a term I like using when I speak with you – you basically just went back to work. Armstrong: Well, yeah, there was work to be done back at the office and so I thought I'd better go get on with it. Malley: I'm trying to line that up with the modern era of occupational health and safety, and it's just not working for me at the moment, Neil, that's extraordinary. We've got some footage that I want to play to you: John F. Kennedy was speaking about the mission and about the vision. This was early in the sixties. Kennedy: ...but why, some say, the moon? Why choose this as our goal? And they may well ask, why climb the highest mountain? Why, 35 years ago, fly the Atlantic? Why does Rice play Texas? We choose to go to the moon. We choose to go to the moon. We choose to go to the moon in this decade and do the other things, not because they are easy, but because they are hard. Because that goal will serve to organize and measure the best of our energies and skills. Because that challenge is one that we're willing to accept, one we are unwilling to postpone, and one we intend to win, and the others too. Malley: The extraordinary time in the US at that time, you had the president of that ilk, you had politics, the administration, science, the community all on song for this vision, all on song for that plan. What was that like? Armstrong: Well, you have to appreciate the context. The Soviet Union had successfully put firstly an artificial satellite into space and secondly put a man into orbit around the Earth. We were trailing. We had put only one flight, Alan Shepard, on a short 20-minute suborbital flight of about a hundred miles altitude and back down into the ocean. Never had a person in orbit and now the president was challenging us to go to the moon. The gap between 20 minutes, a 20 minutes up and down a flight and going to the moon, was something that was almost beyond belief, technically. But NASA was a new organization only about four years old at that point. It had done a lot of thinking about this, and they identified the lunar landing as perhaps the only way we could catch up with the Soviet Union. And as the President said, we were going to get in this game. He was saying, “This is a new ocean around us. This is the new ocean and we must sail upon it and we must be a leader on it”. And that caught people's imagination, because at that time we had the ideological competition between East and West and concerns about the future of all humanity on Earth, so it was a very big thing, not just technically, it was sociologically a very big thing and the challenge was enormous. So to be able to get the agreement of not only the government but the will of the people to go along with that idea was quite striking. Le altre parti seguiranno quando possibile. Da oggi ho messo a disposizione per lo scaricamento anche le versioni non elaborate delle scansioni ad alta risoluzione delle foto a colori della missione Apollo 11, che normalmente sono accessibili sul sito originale soltanto con una trafila molto tediosa. Tutti i dettagli e i link per scaricare le foto sono in questo articolo. Bisognerà attendere il 2021 per vedere smontata dai fatti una delle tesi predilette del lunacomplottismo: quella secondo la quale i voli umani verso la Luna sono fisicamente impossibili a causa delle radiazioni delle fasce di Van Allen che circondano la Terra e quelle dello spazio al di fuori delle fasce stesse. Traduzione: Stiamo preparando un volo di ritorno intorno alla Luna in preparazione per la prima missione mai compiuta per inviare degli esseri umani su un asteroide nel 2025 e poi oltre verso Marte nel decennio del 2030. Il nostro piano attuale, che abbiamo esposto in dettaglio al Congresso e al pubblico, prevede un volo senza equipaggio intorno alla Luna nel 2017 e un volo con equipaggio nel 2021. I tempi lunghi sono dovuti quasi esclusivamente alla carenza di fondi. di Paolo Attivissimo. L'articolo è stato aggiornato dopo la pubblicazione iniziale. Ultimo aggiornamento: 2012/09/15. Oggi a partire dalle 14.00 GMT (le 16 ora italiana) si terrà la cerimonia pubblica per celebrare la vita di Neil Armstrong, morto il 25 agosto scorso. I suoi funerali si sono tenuti in forma strettamente privata il 31 agosto. La cerimonia avrà luogo presso la Washington National Cathedral e sarà possibile seguirla in streaming sul sito della cattedrale e sul sito della NASA. Il programma dell'evento è scaricabile qui. 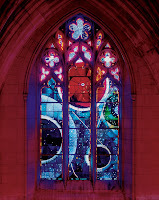 La cattedrale è legata alle missioni lunari per molte ragioni, una delle quali è mostrata nella foto qui accanto (originale ad alta risoluzione qui): il puntino al centro della finestra è una roccia lunare, donata dagli astronauti dell'Apollo 11 (Armstrong, Aldrin e Collins) cinque anni dopo la missione. La registrazione della cerimonia è visibile integralmente qui su C-SPAN e qui sotto potete seguire il ricordo di Neil letto a fatica, per l'affetto e il dolore, da Gene Cernan. Ho registrato e trascritto a mano quello che reputo uno dei più sinceri e sentiti discorsi di commiato: quello dell'astronauta lunare Gene Cernan (Apollo 17), l'ultimo uomo sulla Luna. La traduzione in italiano è più sotto. How does one adequately express his feelings about a special friend, when that friend is also a world icon, a national hero of unimaginable proportion, and a legend whose name will live in history long after all here today have been forgotten? A friend whose commitment and dedication to that in which he believed was absolute? A man who, when he became your friend, was a friend for a lifetime? I'm not sure this is possible, but I will try. 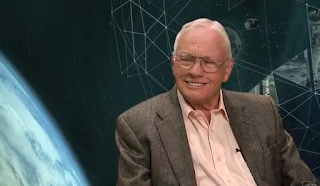 Neil Armstrong grew up on a farm in Middle America and as a young boy, like most kids, he had a paper route, he cut lawns, he shoveled snow, and his fascination for model airplanes gave birth to a dream. A dream of becoming an aeronautical engineer. Neil had his first taste of flight when he was but six years old, and from that day forward he never looked back. Although he always wanted to design and redesign airplanes to make them do what they weren't supposed to do, once he had tasted flight, Neil's eyes turned skyward, and it was there that he always longed to be. Little did Neil ever realize that his dream, his longing to soar with the eagles, would someday give him the opportunity to be the first human being to go where no one had gone before. Neil Armstrong was a sincerely humble man, of impeccable integrity, who reluctantly accepted his role as the first human being to walk on another world. And when he did he became a testament – a testament to all Americans of what can be achieved through vision and dedication. But in Neil's mind it was never about Neil. It was about you. Your mothers and fathers, your grandparents. About those of a generation ago who gave Neil the opportunity to call the Moon his home. But never ever was it about Neil. Neil considered that he was just the tip of the arrow, always giving way to some 400,000 equally committed and dedicated Americans – Americans who were the strength behind the bow – and always giving credit to those who just didn't know it couldn't be done. Neil was special to these young kids and to a few old ones as well. Although deeply proud to be a naval aviator, as a civilian at the time he flew, Neil never received his astronaut wings – it was a tradition of those in the military. It was on the USS Eisenhower, back in 2010, on our way to Afghanistan, that Neil finally did receive the tribute that he deserved. His visibly moved response said it all, and I quote: “I've never been more proud than when I earned my Navy wings of gold.” And I've got to believe that there's a few Golden Eagles in the audience who will second those words. Trying to get into Neil's inner self was always a challenge for almost anyone – maybe everyone. Asked one day by a stranger, “Mr. Armstrong, how did you feel when looking for a place to land on the Moon with only 15 seconds of fuel remaining?” In only the way Neil could – and I know some of you have seen him this way – he'd put a thumb on an index finger, he'd tilt his head and sort of put his hand down there and he'd say “Well, when the gauge says empty, we all know there's a gallon or two left in the tank!” Now there is a man who has always been in control of his own destiny. And that, ladies and gentlemen, is vintage Neil Armstrong. Fate looked down kindly on us when she chose Neil to be the first to venture to another world and to have the opportunity to look back from space at the beauty of our own. It could have been another, but it wasn't. And it wasn't for a reason. No one, no one, but no one could have accepted the responsibility of his remarkable accomplishment with more dignity and more grace than Neil Armstrong. He embodied all that is good and all that is great about America. Neil, wherever you are up there, almost a half century later you have now shown once again the pathway to the stars. It's now for you a new beginning, but for us, I will promise you it is not the end. And as you soar through the heavens beyond where even eagles dare to go, you can now finally put out your hand and touch the face of God. Farewell, my friend. You have left us far too soon. But we want you to know we do cherish the time we have had and shared together. God bless you, Neil. Come si possono esprimere adeguatamente i propri sentimenti per un amico speciale, quando quell'amico è anche un'icona mondiale, un eroe nazionale di dimensioni inimmaginabili, e una leggenda il cui nome vivrà nella storia molto dopo che tutti coloro che oggi sono qui saranno stati dimenticati? Un uomo che, quando diventava tuo amico, era un amico per tutta la vita? Non sono sicuro che sia possibile, ma ci proverò. Neil Armstrong crebbe in una fattoria nel Midwest d'America e da ragazzino, come la maggior parte dei ragazzi, consegnava i giornali, tosava i prati e spalava la neve, e il fascino che avevano su di lui i modelli d'aereo fece nascere un sogno. Il sogno di diventare un ingegnere aeronautico. Neil ebbe il primo assaggio del volo quando aveva soltanto sei anni, e da quel giorno in poi non si guardò mai indietro. Anche se aveva sempre desiderato progettare e riprogettare aerei per far fare loro quello che non dovevano poter fare, una volta provato il volo, gli occhi di Neil si rivolsero al cielo, ed era lì che desiderava sempre essere. Mai avrebbe immaginato che il suo sogno, il suo anelito di veleggiare con le aquile, un giorno gli avrebbe dato la possibilità di essere il primo essere umano ad andare là dove nessuno era mai giunto prima. Neil Armstrong era un uomo sinceramente umile, dall'integrità impeccabile, che accettò con riluttanza il proprio ruolo come primo essere umano a camminare su un altro mondo. E quando lo fece divenne un'attestazione vivente – un'attestazione per tutti gli americani di ciò che si può ottenere tramite la visione e la dedizione. Ma per Neil non era lui il protagonista. Eravate voi. Le vostre madri e i vostri padri, i vostri nonni. Quelli di una generazione fa, che diedero a Neil la possibilità di chiamare casa propria la luna. Ma mai, mai Neil si considerò centrale. Neil si vedeva semplicemente come la punta della freccia, sempre pronto a cedere il riconoscimento a ben 400.000 americani altrettanto impegnati e risoluti – gli americani che erano la forza dietro l'arco – e a dare sempre riconoscimento a coloro che semplicemente non sapevano che quello che dovevano fare era impossibile. E in questo stanno la forza e il carattere di Neil Armstrong. Sapeva chi era, e capiva l'immensità di ciò che aveva fatto, eppure Neil era sempre disponibile a offrirsi. Quando Neil, Jim Lovell ed io avemmo modo di far visita alle truppe in Iraq e Afghanistan, in tre diverse occasioni, incontrandole nelle docce, nei centri di controllo, persino nei blindati e sugli elicotteri, quei giovani uomini e quelle giovani donne, tracimanti d'entusiasmo, non ancora al mondo quando Neil camminò sulla luna, erano incantati dalla sua presenza. Nella sua maniera così tipica, Neil entrava in una sala, si presentava – come se loro non sapessero chi fosse – stringeva la mano a tutti, uno per uno, e chiedeva sempre “Ehi, come va?”. Un Marine, curioso e travolto dall'emozione, gli chiese: “Signor Armstrong, perché lei è qui?” La risposta meditata e sinceramente onesta di Neil fu “Perché voi siete qui”. Neil era speciale per quei giovani – e anche per alcuni dei meno giovani. Sebbene fosse profondamente orgoglioso di essere un pilota della marina, essendo un civile all'epoca del suo volo, Neil non ricevette mai le ali d'astronauta: erano una tradizione dei militari. Fu sulla USS Eisenhower, nel 2010, mentre andavamo in Afghanistan, che finalmente Neil ricevette il tributo che si meritava. La sua risposta, visibilmente commossa, fu eloquentissima. Cito: “Non sono mai stato più orgoglioso di quando mi sono guadagnato le mie ali d'oro in Marina”. E devo pensare che ci sono alcune aquile d'oro fra il pubblico che concorderanno con queste parole. Cercare di entrare nell'intimo di Neil era sempre una sfida per quasi tutti – forse per tutti. Un giorno uno sconosciuto gli chiese: “Signor Armstrong, cosa provò quando stava cercando un posto per atterrare sulla luna, con soli quindici secondi di carburante rimasti?” Nella maniera che solo Neil poteva usare – e so che alcuni di voi gliel'hanno visto fare – univa il pollice e l'indice, chinava la testa di lato, appoggiava la mano sul volto e diceva “Be', quando l'indicatore segna vuoto, sappiamo tutti che nel serbatoio ci sono ancora un paio di litri!”. Ecco, questo è un uomo che è sempre stato padrone del proprio destino. E questo, signore e signori, è il classico Neil Armstrong. Il destino ci è stato generoso quando ha scelto Neil come primo ad avventurarsi su un altro mondo e ad avere la possibilità di volgersi indietro, dallo spazio, verso la bellezza del nostro mondo. Sarebbe potuto essere qualcun altro, ma non lo fu, e per una buona ragione. Nessuno, nessuno, ma proprio nessuno avrebbe potuto accettare la responsabilità del suo risultato straordinario con più dignità e grazia di Neil Armstrong. Lui rappresentava tutto quello che c'è di buono e di grande dell'America. Neil, dovunque tu sia lassù, quasi mezzo secolo dopo ci stai mostrando ancora una volta la via verso le stelle. Per te, ora, c'è un nuovo inizio; ma per noi, te lo prometto, non è la fine. E mentre veleggi nei cieli oltre dove osano le aquile, puoi finalmente tendere la mano e toccare il volto di Dio. Addio, amico mio. Ci hai lasciato troppo presto. Ma vogliamo farti sapere che serbiamo come un tesoro il tempo che abbiamo speso e condiviso insieme. di Paolo Attivissimo. Questo articolo vi arriva grazie alla donazione per il libro “Luna? Sì, ci siamo andati!" di helitecnico ed è stato aggiornato dopo la pubblicazione iniziale. Cinquant'anni fa, il 12 settembre 1962, il presidente statunitense John Fitzgerald Kennedy tenne il discorso che portò l'uomo sulla Luna. Le sue memorabili parole alla Rice University in Texas, compreso l'ormai storico “We choose to go the Moon”, (“Scegliamo di andare sulla Luna”), sono ascoltabili nella loro interezza in un filmato a colori scaricabile, mostrato qui sotto, e in questa ripresa video dell'emittente di Houston KHOU-TV. No man can fully grasp how far and how fast we have come, but condense, if you will, the 50,000 years of man's recorded history in a time span of but a half a century. Stated in these terms, we know very little about the first 40 years, except at the end of them advanced man had learned to use the skins of animals to cover them. Then about 10 years ago, under this standard, man emerged from his caves to construct other kinds of shelter. Only five years ago man learned to write and use a cart with wheels. Christianity began less than two years ago. The printing press came this year, and then less than two months ago, during this whole 50-year span of human history, the steam engine provided a new source of power. So it is not surprising that some would have us stay where we are a little longer to rest, to wait. But this city of Houston, this State of Texas, this country of the United States was not built by those who waited and rested and wished to look behind them. This country was conquered by those who moved forward – and so will space. Those who came before us made certain that this country rode the first waves of the industrial revolutions, the first waves of modern invention, and the first wave of nuclear power, and this generation does not intend to founder in the backwash of the coming age of space. We mean to be a part of it – we mean to lead it. For the eyes of the world now look into space, to the moon and to the planets beyond, and we have vowed that we shall not see it governed by a hostile flag of conquest, but by a banner of freedom and peace. We have vowed that we shall not see space filled with weapons of mass destruction, but with instruments of knowledge and understanding. There is no strife, no prejudice, no national conflict in outer space as yet. Its hazards are hostile to us all. Its conquest deserves the best of all mankind, and its opportunity for peaceful cooperation many never come again. But why, some say, the moon? Why choose this as our goal? And they may well ask, why climb the highest mountain? Why, 35 years ago, fly the Atlantic? Why does Rice play Texas? In the last 24 hours we have seen facilities now being created for the greatest and most complex exploration in man's history. We have felt the ground shake and the air shattered by the testing of a Saturn C-1 booster rocket, many times as powerful as the Atlas which launched John Glenn, generating power equivalent to 10,000 automobiles with their accelerator on the floor. We have seen the site where five F-1 rocket engines, each one as powerful as all eight engines of the Saturn combined, will be clustered together to make the advanced Saturn missile, assembled in a new building to be built at Cape Canaveral as tall as a 48-story structure, as wide as a city block, and as long as two lengths of this field. To be sure, all this costs us all a good deal of money. This year¹s space budget is three times what it was in January 1961, and it is greater than the space budget of the previous eight years combined. That budget now stands at $5,400 million a year – a staggering sum, though somewhat less than we pay for cigarettes and cigars every year. Space expenditures will soon rise some more, from 40 cents per person per week to more than 50 cents a week for every man, woman and child in the United States, for we have given this program a high national priority – even though I realize that this is in some measure an act of faith and vision, for we do not now know what benefits await us. But if I were to say, my fellow citizens, that we shall send to the moon, 240,000 miles away from the control station in Houston, a giant rocket more than 300 feet tall, the length of this football field, made of new metal alloys, some of which have not yet been invented, capable of standing heat and stresses several times more than have ever been experienced, fitted together with a precision better than the finest watch, carrying all the equipment needed for propulsion, guidance, control, communications, food and survival, on an untried mission, to an unknown celestial body, and then return it safely to earth, re-entering the atmosphere at speeds of over 25,000 miles per hour, causing heat about half that of the temperature of the sun – almost as hot as it is here today – and do all this, and do it right, and do it first before this decade is out – then we must be bold. Altre immagini e informazioni sul discorso sono presso GRIN, GRIN, JFK Library, KUHF (video), KUHF (foto) e NASA. di Paolo Attivissimo. Questo articolo vi arriva grazie alla donazione per il libro “Luna? Sì, ci siamo andati!" di giuseppetro*. Quello che vedete qui accanto è un corpo macchina Hasselblad EL/M originale, molto simile a quello usato durante le missioni Apollo. 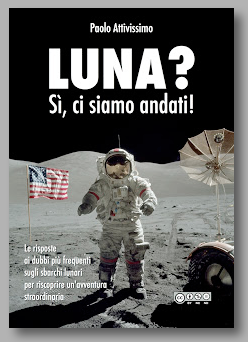 L'ho comprato, usato ma funzionante, per le mie conferenze sugli sbarchi lunari: serve per mostrare concretamente le tecniche e gli apparati usati per realizzare le straordinarie foto degli astronauti sulla Luna. Purtroppo, però, il corpo macchina è privo di un obiettivo e questo rende meno efficace la dimostrazione. 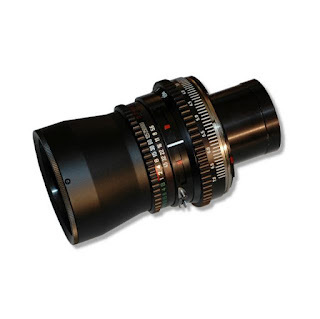 Un obiettivo Zeiss Biogon da 60mm per Hasselblad, del tipo usato sulla Luna, ha un costo assolutamente proibitivo per le mie finanze. Ho provato a cercarne un esemplare danneggiato o rotto, che andrebbe benissimo, dato che lo scopo è mostrare le forme e gli ingombri delle fotocamere lunari, ma è introvabile. Ho cercato anche se qualcuno aveva creato un modello per uso come oggetto di scena o come simulacro da esposizione: niente. Un obiettivo Zeiss Biogon 60mm standard. macchina quando l'obiettivo è montato. anche con i guanti della tuta spaziale. A fine agosto, mentre collaboravo con i lettori per la pubblicazione delle scansioni GAPE delle foto della missione Apollo 11, mi è stato segnalato il sito di GoneToPlaid, Apollo.mem-tek.com, che contiene fra le altre cose la scansione della scheda tecnica dell'obiettivo. Nella scheda tecnica c'è il disegno in sezione del'obiettivo, con le dimensioni corrispondenti. Così mi è venuta un'idea: fabbricare una replica dell'obiettivo creando un modello digitale CAD e poi usando un tornio oppure una stampante 3D. Non avendo nessuno dei due apparati e non avendo il tempo di creare un modello digitale da inviare a Shapeways o altri fabbricanti 3D, ho lanciato un tweet di richiesta d'aiuto e la Rete è prontamente arrivata a risolvere il problema: @marcoalici non solo ha creato il modello CAD e l'ha caricato su Shapeways, semplificandolo in modo da ridurne il costo, ma si è anche offerto di fabbricarlo con la sua stampante 3D RepRap Huxley e di spedirmelo gratuitamente. Detto fatto: pochi giorni dopo mi è arrivato il simulacro dell'obiettivo, che vedete qui accanto. L'ho carteggiato e verniciato a spruzzo in nero opaco e poi ho ordinato un tappo per corpo macchina Hasselblad (trovato in Germania tramite Amazon, di marca alternativa, per ben sette euro e novanta), che ho avvitato sul fondo del simulacro d'obiettivo, creando così un innesto a baionetta ultraeconomico. Il risultato finale è nella foto qui sotto: ho scelto di lasciarlo leggermente grezzo e di non aggiungere le diciture e le serigrafie dell'originale per non dare l'impressione di voler imbrogliare e rendere chiaro che si tratta di una pura sagoma d'ingombro. Ora le mie dimostrazioni saranno più fedeli e chiare. Grazie, Marco! Oggi è il decimo anniversario di un evento importante nella storia delle missioni lunari: il cazzotto dato da Buzz Aldrin al lunacomplottista Bart Sibrel, che lo molestava e lo accusava di essere un “codardo, un bugiardo e un ladro”. Era il 9 settembre 2002. 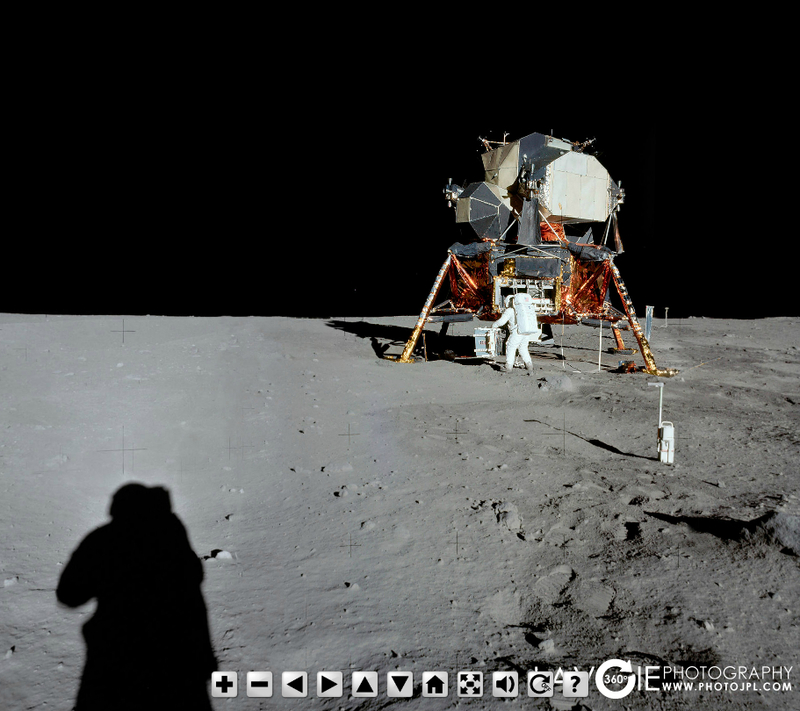 Quello che vedete qui accanto è solo un piccolo pezzo della panoramica zoomabile a 360° realizzata da PhotoJPL.com componendo digitalmente le immagini scattate da Neil Armstrong durante l'escursione lunare della missione Apollo 11. I pianificatori delle riprese fotografiche ebbero infatti la lungimiranza di dare istruzioni agli astronauti affinché scattassero serie di fotografie restando fermi in un punto e ruotando su se stessi. Con l'aiuto delle tecniche odierne di elaborazione digitale è possibile comporre queste serie per ottenerne una visione nitidissima del panorama visto dagli astronauti di quella storica escursione. 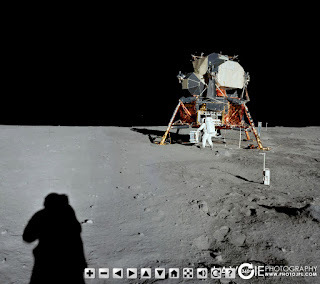 In questa panoramica, l'ombra appartiene a Neil Armstrong; l'astronauta che sta operando sul retro del modulo lunare è Buzz Aldrin. Buona visione. di Paolo Attivissimo. Questo articolo vi arriva grazie alla donazione per il libro “Luna? Sì, ci siamo andati!" di cod328* ed è stato aggiornato dopo la pubblicazione iniziale. Ultimo aggiornamento: 2017/06/28. 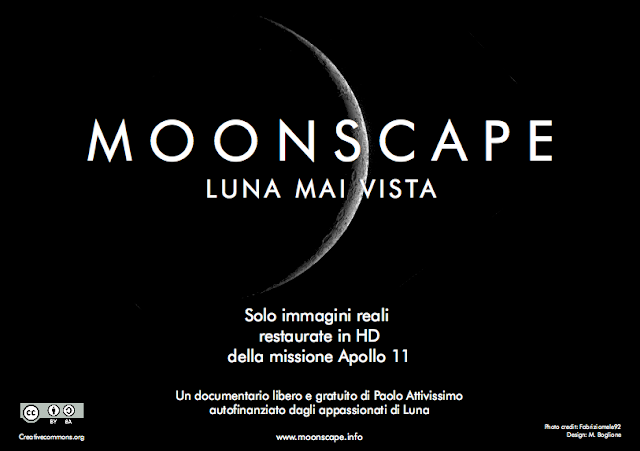 La serie completa delle scansioni in alta risoluzione (20 megapixel) delle fotografie Hasselblad scattate dagli astronauti durante la missione Apollo 11, archiviata presso il sito GAPE ma accessibile solo con una procedura molto complessa, è ora disponibile per lo scaricamento diretto sotto forma di archivi ZIP, linkati qui sotto. Queste sono, al momento attuale (2012), le migliori scansioni pubblicamente disponibili delle immagini di Apollo 11, superiori a quelle di ApolloArchive.com, e costituiscono un riferimento assoluto per chiunque voglia conoscere a fondo il primo sbarco sulla Luna. 2017/06/28: Una scansione di pari qualità è ora disponibile presso il Project Apollo Archive su Flickr e include anche le foto di tutte le altre missioni Apollo. Ringrazio Andrea Tedeschi, che si è occupato della correzione del colore; Tarcisio Bee, che ha effettuato l'estrazione dal sito GAPE; e Alex, Gospel e Andrea Draghetti, che hanno preparato i torrent (ora non più in uso). Sulle foto in bianco e nero non è stata effettuata alcuna elaborazione. Caricatore N36 (142 foto a colori) - Armstrong e Collins nel CM, Terra dall'orbita terrestre, sgancio dall'S-IVB ed estrazione del LM, Terra durante il viaggio verso la Luna, docking probe, tunnel CSM/LM, Aldrin nel LM, Luna dall'orbita lunare. Caricatore O38 (181 foto in bianco e nero) - Luna dall'orbita lunare, Luna e Terra durante il viaggio di ritorno. Caricatore P41 (189 foto in bianco e nero) - Luna dall'orbita lunare, con Terra che “sorge” da dietro la Luna. Caricatore Q39 (107 foto in bianco e nero) - Foto scattate dall'interno del LM prima e dopo l'escursione. Caricatore R37, prima parte (16 foto a colori) - Foto scattate dall'interno del LM in orbita lunare e durante il volo separato dal CM. Per la foto 5447, segnalo che la versione proveniente dall'archivio del Lunar and Planetary Institute è molto più bilanciata cromaticamente di quella proveniente dall'archivio GAPE (che è quella inclusa in questo file ZIP). Caricatore R37, seconda parte (107 foto a colori) - Foto scattate dall'interno del LM sulla superficie della Luna, prima e dopo l'escursione lunare. 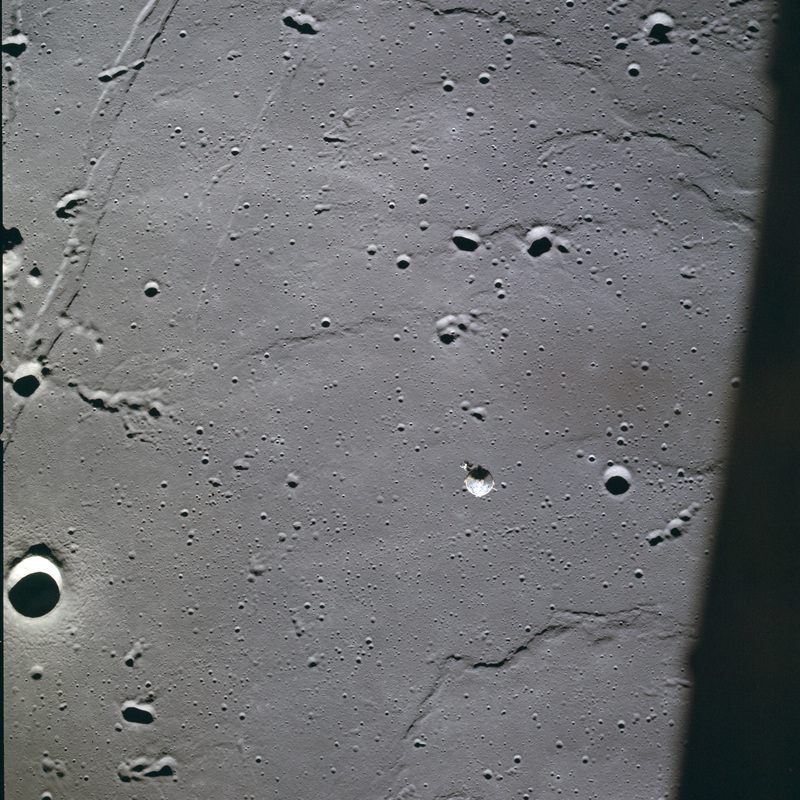 Ritratti di Armstrong e Aldrin (5528-5534). La 5537 non è stata bilanciata cromaticamente. Caricatore S40, prima parte (3 foto a colori) - Foto della Luna scattate dall'orbita lunare, dall'interno del LM, prima dell'allunaggio. Ho archiviato separatamente queste tre foto rispetto alle altre del caricatore S40 per consentire di scaricare un file ZIP (S40 terza parte) contenente soltanto le foto dell'escursione lunare. Caricatore S40, seconda parte (3 foto a colori) - Foto scattate dalla superficie della Luna, dall'interno del LM, prima dell'escursione lunare. Come per la prima parte, ho archiviato queste tre foto separatamente dalle altre del caricatore S40 per offrire un file ZIP, quello della terza parte, contenente soltanto le foto dell'escursione lunare. Caricatore S40, terza parte (123 foto a colori) - Foto scattate sulla Luna durante l'escursione lunare di Armstrong e Aldrin. La foto 5966A (scatto nero) proviene dall'archivio del Lunar and Planetary Institute perché manca nell'archivio GAPE. Caricatore T43 (191 foto in bianco e nero) - Foto della Luna scattate dall'orbita lunare. Caricatore U42 (189 foto in bianco e nero) - Foto della Luna scattate dall'orbita lunare. Molte sono nere o sottoesposte. Caricatore V44 (156 foto a colori) - Foto scattate dall'orbita lunare. Terra che “sorge” da dietro la Luna. Sgancio del LM prima della discesa sulla Luna. Avvicinamento e riaggancio del LM dopo il decollo dalla Luna. Luna e Terra durante il viaggio di ritorno.